There was a time a few years back that the idea of getting serious about playing poker was probably the farthest thing from my mind. Then one day my wife was surfing around trying to find something worth watching on cable and running into the ironic problem of having sixty some channels and nothing to watch. Then she landed on the Travel channel where she found, of all things, a World Poker Tour tournament game. She had her doubts at first but because there simply wasn’t anything else fit to watch anywhere else, she started watching. It didn’t take long for her to pretty much become hooked, watching for strategies and mistakes on the part of the players. When she told me about it and how fascinating she fount it I have to admit I was extremely doubtful that I’d actually enjoy watching that but because she was so interested I sat down with her the next week it was on and watched. I started out with the attitude that I’d rather accompany her to a white sale on black Friday but it didn’t take long for me to see the fascination. The strategy and tactics these guys were using. How one guy could take a hand that had no right winning and claim a million dollar pot with it. That was it, I was hooked, Texas Hold’em Poker was my new favorite pastime. 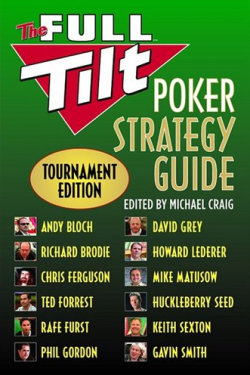 It’s loaded cover to cover with tournament strategy tips from such Ace players as Andy Bloch, Howard Lederer, Chris Ferguson, Mike (the mouth) Matusow, Ted Forrest, Phil Gordon and more. I figure that since each and every one of these people have made millions playing Texas Hold’em, they probably know pretty much what they’re talking about and I want to squeeze every bit of information out of all of ’em that I can. You can laugh or disbelieve if you want but I fully intend to some day be sitting at the final table of the WSOP Main Event and have the shot to beat each and every one of these people. What’s more, I intend to do it without investing in anything other than a book or six like this one. The key to being able to do this is Freeroll tournaments. These are games that cost nothing to enter and pay out cash prizes to the top finishers. My idea is to use winnings from Freeroll tournaments to bankroll real money games. Starting first with “micro stakes” games with a buy in of $1.00 (or less) and building the bankroll until it’s possible to play in successively higher and higher stakes games. That, combined with continuing to play freeroll tournaments, especially those that are actually satellites into bigger tournaments with bigger prizes. I *know* this is possible. Last year at the WSOP Main Event (that’s the biggest game of the season with over 6,000 people buying in at $10,000 a seat) there was a guy sitting at the final table that had literally won his way there. He started out playing freeroll online games like I’m planning to do. If I remember right, He finished 3rd or 4th taking home well over $300,000 cold hard cash. As for me, the next step on my Freeroll Adventure starts in about half an hour after I hit “publish” for this post. I am entered in the “$20K Record Breaker Freeroll” where the top 4,000 finishers will get a free entry into “The Record Breaker”, a tournament where Full Tilt Poker is attempting to break the Guinness world record for the most players in a single tournament. This satellite tournament alone is expected to have 30,000 players registered by the time it starts. For the record breaker game itself, I don’t know what they’re expecting, but the game info says it’s set to allow up to 50,000 players to start. That ought to be a blast! Last August a voluntary program went into effect that allowed people traveling to the U.S. under the visa waiver program to register online instead of wasting huge chunks of time in the airport filling out forms. Now, effective last Monday, this is no longer an option, it’s a mandatory requirement. The rules cover the citizens of 35 countries that do not require a visa to enter the U.S. People who don’t comply get to face the risk of either delays of who knows how long or even being denied entry entirely. The whole thing is, of course, being justified under the “protecting us from terrorists” load of crap. In truth, it’s just another way to increase the ways that Homeland Security can monitor more and more people and their movements. Is Msft Granting Another Six Months of Vista with Downgrade Option? OEM computer makers can now offer deals like that until January 31, 2009 as opposed to the July 31, 2009 that this announcement would extend it to. The downside of this is that according to slashdot, niether Microsoft or any OEM has said anything to confirm or deny the statement so it has to remain classed as a rumor for now. Not only are they snooping on the browsing habits of customers, it’s going a lot farther than that. First there’s an article on dailymail.co.uk where BT, One of the UK’s largest ISPs, admits to spying on 36,000 customers. The article tells how BT chose 36,000 of it’s users for a trial run in which they tested a system developed by a US software company called “Phorm”. They’ve got this new idea for serving targeted advertising where basically your web browsing traffic is intercepted, analyzed, and used to serve targeted advertising. There’s an article on The Register that details How Phorm plans to tap your internet connection and it’s an insidious thing with it’s roots firmly entrenched in spyware. What’s really annoying about it is that you actually have to opt out of it if you don’t want to be part of it. Apparently the way these UK ISPs are going to do this is that you’ll be opted in unless you specifically jump through hoops to opt out. Fortunately, for Firefox users there is something that can help. There’s a Firefox plugin called “Dephormation” that opts you out of phorm everywhere you encounter it and it also lets you know when you run into a website that’s got a connection to one of their “webwise” sites. Once I had that plugin installed, I found that going to this link got me a notification that Dephormation had found a link to a Phorm/Webwise/oix/ site. Right now, this online invasion of privacy seems to be mostly in the UK, but don’t be surprised when it starts showing up in the US. it’s just another step along the way to having everything we do or look at monitored in some way. It would be a good idea to stop right now, before building another web page with flash movies on it to stop and take a look at this article in The Register about Flash vulerabilities.